than you ever have in your lifetime! as you break through writer’s block with ease! To do this you must eliminate distractions, so stop the chaos and get organized! Thesaurus, Rhyme Books, Note Pads and scraps of paper. If you’re serious about songwriting, Here’s and offer you can’t refuse! 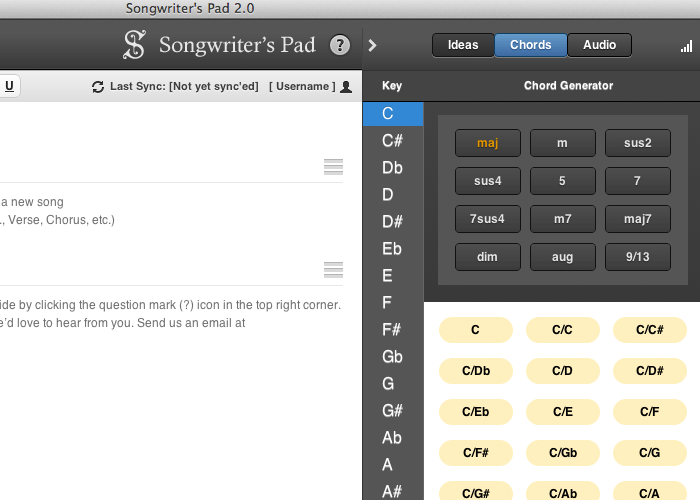 Download Songwriter’s Pad Now And try the full version FREE for 14 Days! you are ready right now, to sit down and write your next hit! Then and only then will you benefit from the free trial and discover its true potential. 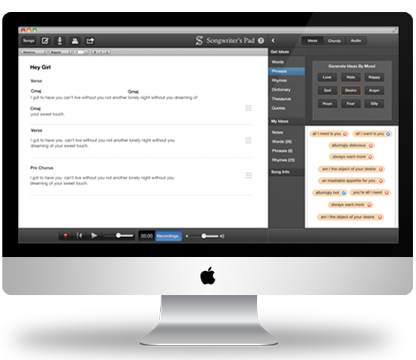 You will see that you CAN write songs better and faster than ever before, and that $49 is a true bargain for a program that will benefit you for a lifetime. Download the Free Trial or Buy It Now! Bar none, it will be the best investment you ever made for your songwriting career! In a word, wow….the changes you’ve made, both to the interface, and its underlying functionality, are huge in terms of smooth, seamless operation. Just had the time recently to sit down and work on a new song, and it was an absolute pleasure to put it together in the new Songwriter’s Pad…it was so intuitive, I didn’t have to think about “what or how”, I could just listen to the MP3 and concentrate on coming up with the right words and phrasing for what I was trying to say with the song. Tires kicked, and very impressed by your sports car! Created for us, by us! 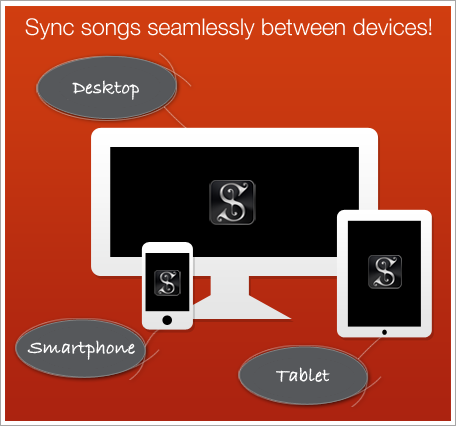 That’s why its used by songwriters everywhere including many Grammy Award winners. Customer feedback has made SP what it is today! When you released the app it was a God send because it meant that I could leave my laptop at home and just use my iPhone or iPad. It also meant that I had a suitable replacement for a program I use called Master Writer. You should be proud of what you created. The efficiencies in workflow really streamline the writing process. Plus, I've started using the built in recorder to capture ideas for alternate melody lines when they occur; I don't have to wait until I get set up in the studio. How would I write a review about this app? 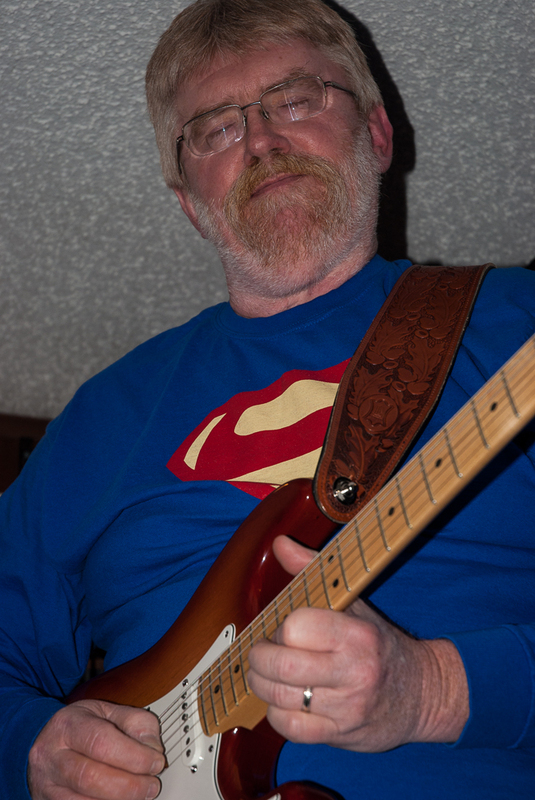 I'm a multi Grammy and Dove award winning singer songwriter and would love to help. I know I've turned at least 8-10 friends on to this app! I really love your app! I think it's a fantastic tool for organizing your musical ideas. First, I downloaded the free version of the app to check it out. Then, I decided to upgrade because I was enjoying it so much. 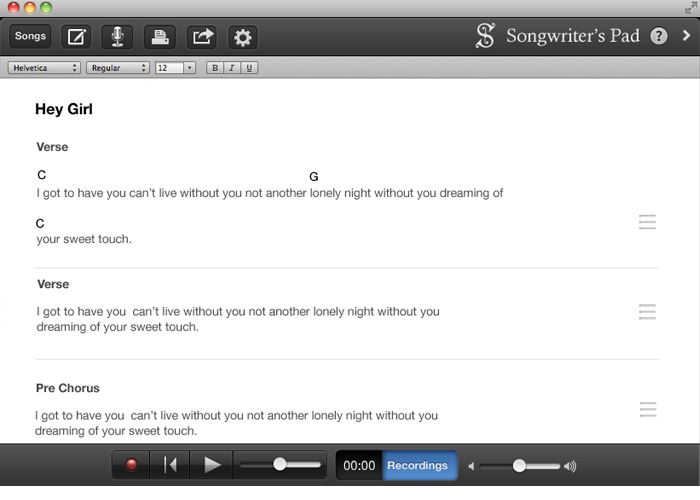 Hey I love the songwriter app and I'm switching over to using it exclusively (as opposed to both a word processor and voice memos)…Thanks! 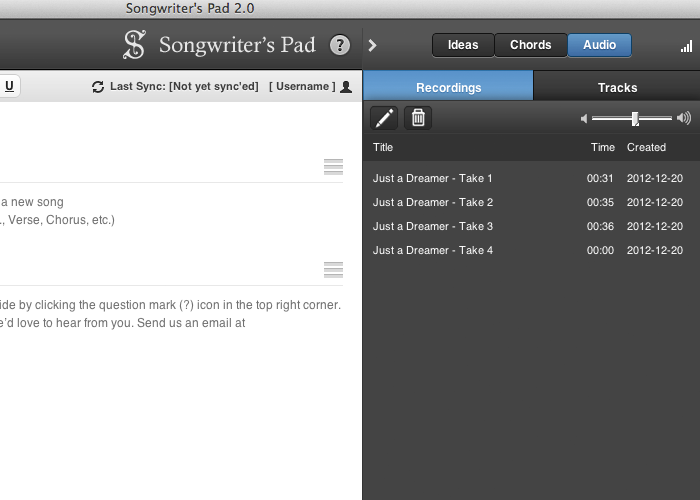 I have been using the Songwriter’s Pad app on my IPad for quite a while now. I absolutely LOVE using the app. I’ve been writing here in Nashville for 12 years now and it has become pretty much the only application I use while writing. It makes things MUCH easier! 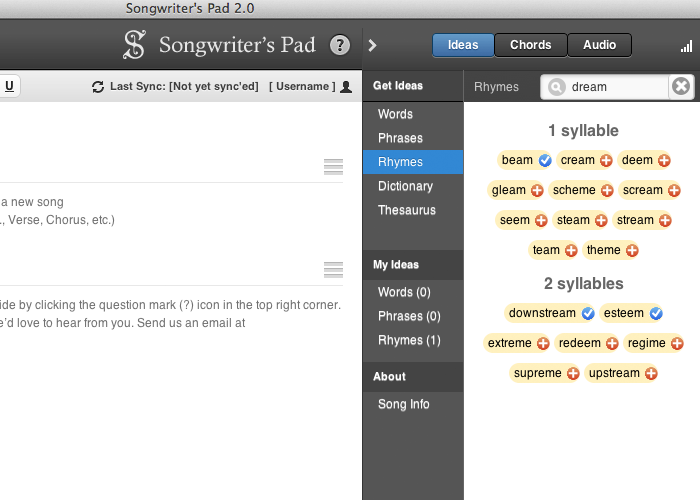 I’ve turned most of my co-writers on to the app as well. Just wanted to say thank you for developing the app, it really does what it says in the description and has helped me a lot! 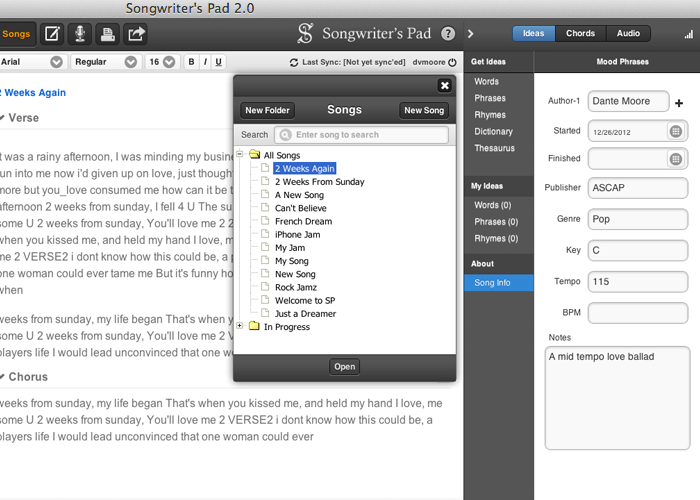 …it's a great tool to have as a songwriter so thank you for all of your work! 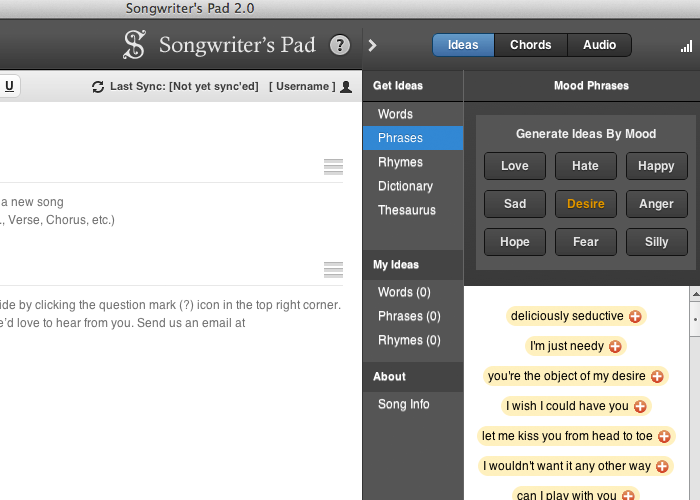 I use your app all the time I think it's great…its made songwriting a pleasure for me.